Starting time will be announced soon. Of Serra (to movement) begins with the forms of Richard Serra’s iconic Prop pieces and performs a substitution of materials—from steel forms to human bodies. Sound design by Paula Matthusen. With performers Maho Ogawa and Vitche-Boul Ra. 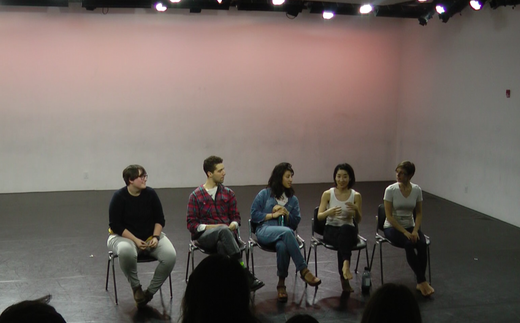 Maho Ogawa performs in Athena Kokoronis's work with wonderful artists on June 9 2018 at Dance and Process at The Kitchen. 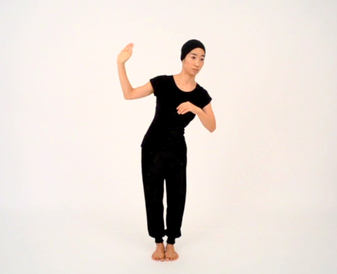 Starting in 2013, Minimum Movement Catalog (www.suisoco.com/choreography/minimum-movement-catalog/) currently consists of 83 movement instructions, an ongoing study that archives the simplest movements of the human body and compares them in different media and structures. 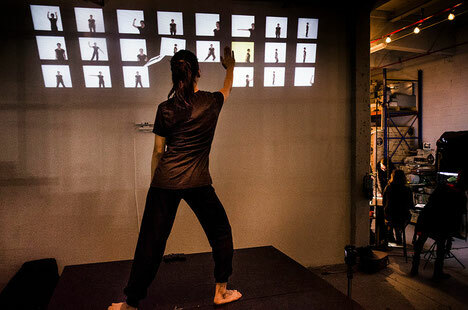 This movement-based research aims to reveal clarity in mechanisms and systems of body movements with the goal of finding objective methods of executing movement. 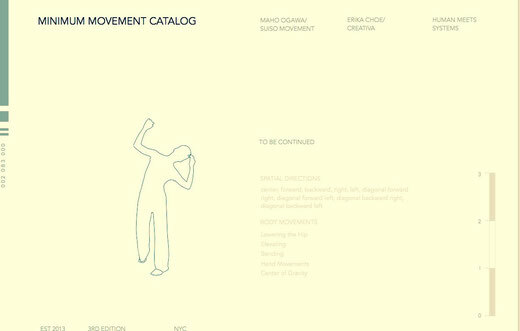 I’m sharing my newest installment of my ongoing study "Minimum Movement Catalog" inviting a graphic designer Erika Choe as a collaborator. Erika and I are seeking a new way to express human body’s movement in graphic design and the actual movements. The process has been very exciting and this project is kind of a dream come true to me since I was fantasizing to collaborate with other media using my movement database Minimum Movement Catalog. Erika seems perfect for this setting. I hope you can come to witness our process. PSOH: February features work by Ayano Elson, Maho Suiso Ogawa (pictured), and Kristopher K.Q. Pourzal. 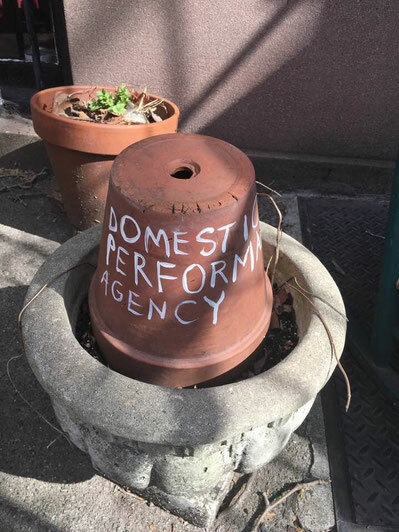 At the next performance happening at the DPA, Maho Suiso Ogawa will present her choreographic material, “The Way of Drinking Hot Water”. In “The Way of Drinking Hot Water” Suiso will pull together elements of ritual and sensorial textures to accompany her usage of the Minimum Movement Catalog. 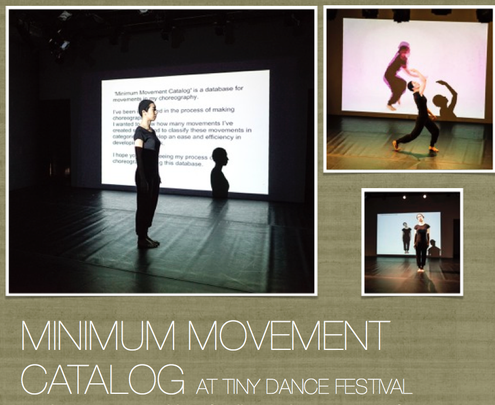 Minimum Movement Catalog is a database of 112 movements which Suiso has created and continues to compile through the years. In it, she notes the fine or hard to see movement components within a larger gesture. Hope you will join us for one of these shows. Maho "Suiso" Ogawa is a New York based movement artist originally from Japan. After studying ballet, traditional Japanese dance, Butoh, and graduating from Wako University, She came to the U.S. in 2011. 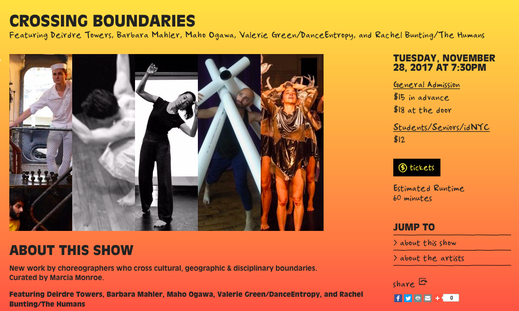 Her works have been shown in various venues in Tokyo, Seoul, and New York: Raft in Tokyo, Korea & Japan Dance Festival in Seoul, Whenever Wherever Festival in Tokyo, Za Koenji in Tokyo, Dance New Amsterdam Theater in NY, Soak Festival at Cave in NY, The CURRENT SESSIONS at Wild Project in NY, Spring Movement at the Center for Performance Research in NY, New York University Grey Gallery in NY. 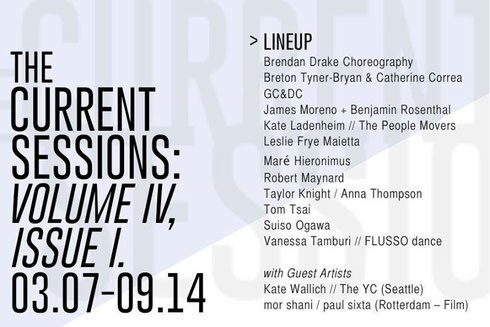 She’s given many choreography workshops with performance residencies. 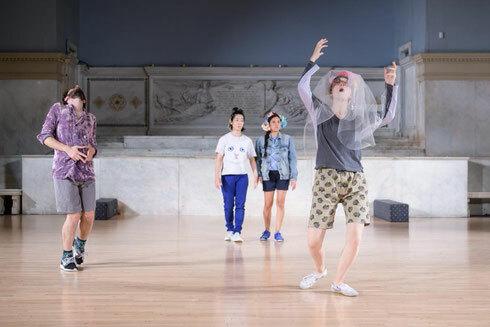 Ogawa’s work was presented by the Whenever Wherever Dance Festival in 2010, 2011 & 2013 in Tokyo. 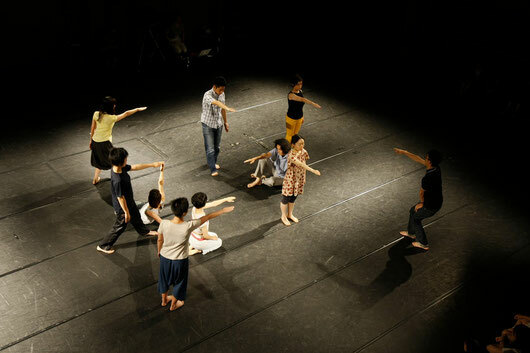 For example, the work “GRID on GRID” (2010) was presented on the stairs in front of Asahi Art Square building in Tokyo, and “Grid with fingers and arms” (2011) was live streamed over the internet as well as performed at Morishita Studio in Tokyo. In 2013 the Tokyo Culture Creation Project invited her to research and create a piece about the human body’s behavior. The work, “Behavior Patterns for the 23rd Century”, supported by a Tokyo Metropolitan Government grant, was composed of people’s subconscious movement patterns in daily life. 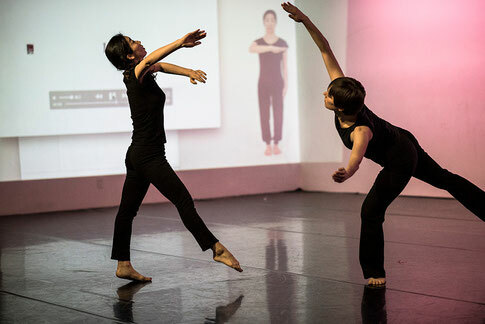 Her movement database “Minimum Movement Catalog(MMC)” was published in an on-line magazine “Conectom”, published by LEIMAY in 2013, and its theater version was presented at the Soak Festival(NY), The CURRENT SESSIONS(NY), Spring Movement(NY), and Whenever Wherever Dance Festival(Tokyo). 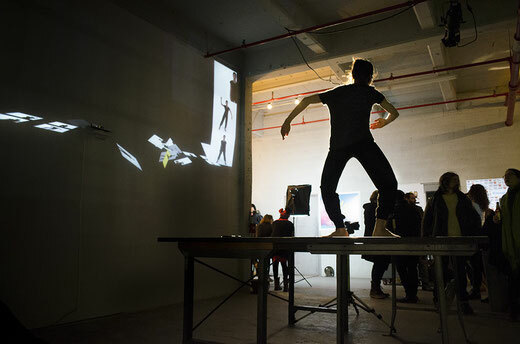 Ogawa is performing in the exhibition FOR A NEW WORLD TO COME at Grey Art Gallery NYU. With Kunié Sugiura, artist in the exhibition; Suiso Ogawa, dancer and choreographer; and Pato Hebert, associate arts professor of Art & Public Policy, NYU. 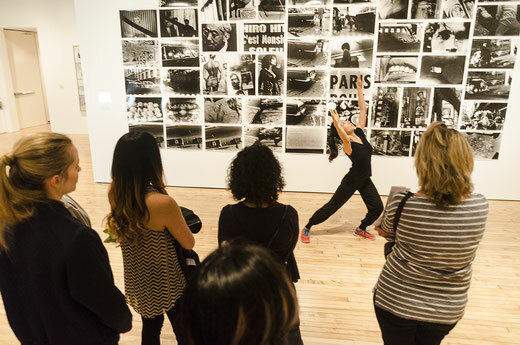 and Japan Society Gallery (October 9, 2015–January 10, 2016). teaching 'Creative Movement W.S.' 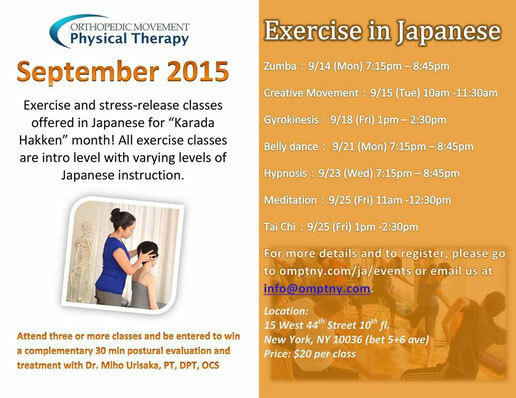 in Japanese at OMPTNY. This Creative Movement Workshop aims to communicate with you and your body, other people, and the environments around you (floor, space, time, etc) through physical contact, without speaking. It’s a form of nonverbal communication. By setting aside judging and anticipation, allow your mind to relax and listen what your body feels, following your body’s inner voice. It’s not a dance method nor a sport, purely for enjoying movements itself through moving freely and communicating with others through movements. By enjoying what your body feels you’ll find your center or core of yourself, and at the same time feel purified and released. No dance or sports experience required. Siiso-Maho Movement Workshop in Kamakura, Japan on Aug 3 2014. Date-April 27th Sunday at 7pm. $15 Student/Senior/East Village Residents* (with valid ID; *at the door only).